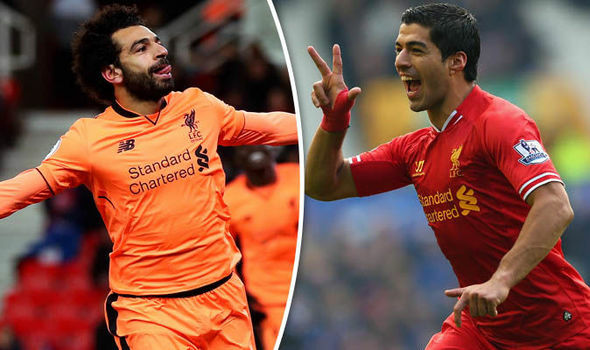 Mo Salah’s incredible start to life at Liverpool has led to comparisons with our last brilliant forward Luis Suarez, but Jurgen Klopp thinks the two have key personality differences. Suarez notched 61 goals in his final two seasons in red, before sealing a move to Barcelona, for whom he’s already scored 126 times. Salah is already on 17 since we bought him from Roma in the summer, with many believing he can actually better Suarez’s 31 goal haul from 2013/14. According to Klopp, Salah lacks aggression and leadership qualities, but this makes him well liked in the squad, who are delighted for the 25-year-old’s progress. Luis Suarez during his best season for Liverpool in 2013/14. “Suarez was an aggressive leader,” Klop told the Telegraph. “For sure, Mo isn’t this kind of guy! “If footballers would be kind of jealous of other players when they are very successful then they would not be here. In fairness, it would be nice to have players with Suarez’s killer attitude in the side, but we’re not complaining about Mo! Some experienced, ‘nasty’ players would benefit us, especially in midfield and the defence. We’ve lost too many leads under Klopp, so we hope this is something that can be sorted in the coming transfer windows.